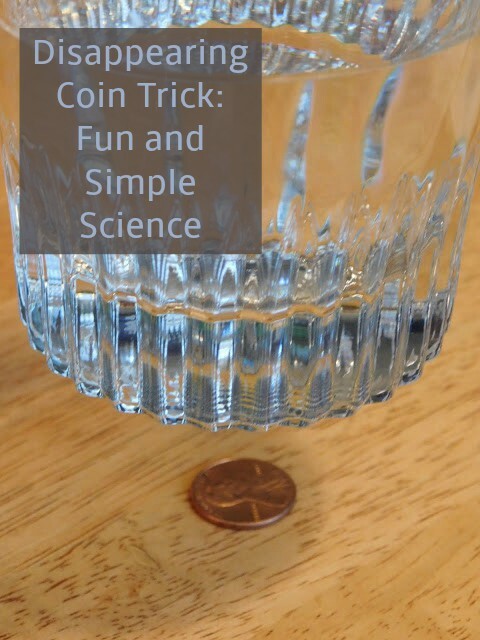 We found another quick, fun, and easy science experiment to try out. We call this the disappearing coin trick. We set the coin on the table and placed our glass on top. We all agreed that we could see the coin. Now it's important to tell you that you should be sitting so you can see the coin through the sides of the glass. If you look over the top of the glass it will not disappear. I promise you I did not move my camera AT ALL for the next photo. While I sat holding my camera and watching the coin I had one of the boys pour water from our other glass into the glass covering the penny. Watching closely it just disappeared! Lifting up the glass we can see that the penny is still there; it just disappears from sight due to the way that the light bends as it passes through water. The light that would normally be reflecting off of the coin has gone off in a different direction. (This is why the coin is still visible from the top of the glass). We tried a second very similar experiment. Using the glass with the water in it; we added two regular drinking straws and saw that if we looked through the sides of the glass the straws appeared to be broken. My boys thought these experiments were so neat and I hope you do too. My son just got a new magic kit. He loves stuff like this. I'm going to wow him these tricks :) So fun. Thanks! You're welcome! I hope he likes it. Thank you for sharing your fun moments with us. You inspire me to try more things with my girls.